Doing business as Aaron Templer LLC since 2008, Three Over Four was built with a client-side perspective: We’re the agency we always wanted to hire. We’re as much an extension of your marketing team as an agency. And we’re finding new ways to add value to clients with each engagement. Three Over Four was born of the Free Agent Age. We take advantage of the ever-increasing talent pool of free agent marketing professionals to pull together the right teams for our clients. Right talented, right sized, right experienced, and right budgeted. This stands in contrast to the traditional agency approach. Your branding and marketing services team is built for you, delivering stronger value. It’s also a much more agile model. If a campaign isn’t working we can pivot resources quickly into different areas. Three Over Four refers to a basic polyrhythm in music: Playing two different subdivisions of time and space, together at the same time, for deeper and richer meaning. Three Over Four’s roots are in strategy, which is polyrhythmic: Making meaning out of seemingly different data, and aligning internal company beliefs with market-engaging stories. Three Over Four’s core and driving value is also polyrhythmic: We constantly seek richness in diverse ideas from diverse people. We seek it because it results in better solutions for our clients. Plus it’s a more enriching space to work in. Three Over Four also refers to the underpinnings of swing, which is the rhythmic foundation of jazz. Like jazz Three Over Four uses the power of values-based leadership. It’s the most effective path to influence: Understanding and aligning shared values, and acting as servants to all stakeholders. 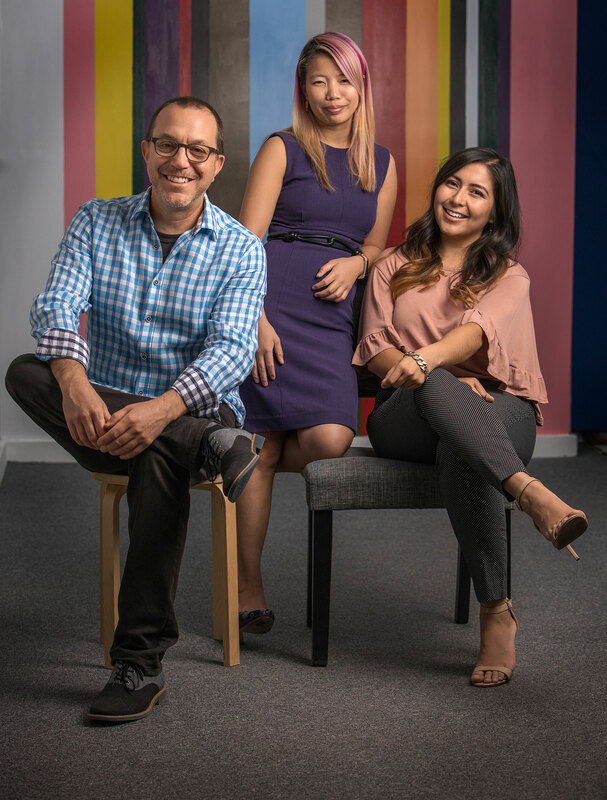 The Three Over Four core team: Aaron, Paula, and Blanca.